It was in August 2012. Ruskin Island close to Colombo, Sri Lanka that SoundCamp came to life : An range musicians and producers from Pakistan, Afghanistan, India, Bangladesh, Sri Lanka and Germany were invited to spend12 intense days and nights making tracks, building and experimenting with hardware, jamming, hanging out and sharing ideas and inspiration. Curated by German House/Techno activists Gebrüder Teichmann, financed by the Goethe Institute and co-organised by Border Movement, SoundCamp set a precident for a creative format of this type and the closing party at Pettah Interchange saw beginning of a new chapter in terms of club culture in South Asia. 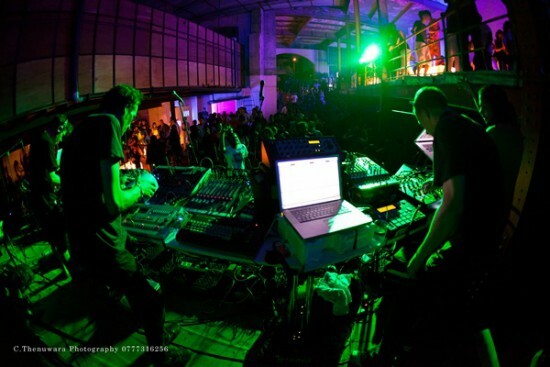 Pettah Interchange was born out of the template of used in Berlin in the 90s (or the definitive warehouse party that originated in Detroit in the 80s). An empty building located next to the old harbour of Colombo in Pettah was transformed into a make-shift space for visual installations, a concert and a full on rave. A multidisciplinary form of entertainment and freedom which is rarely seen in South Asian cities such as Colombo. The Gaffour building was brought back to life for one night, showcasing works from local art scene, DJ sets from the participants of SoundCamp, as well as a collaborative electro-accoustic live act based on the material made during the Ruskin island productions sessions. Following the impact of Soundcamp Sri Lanka, Soundcamp Pakistan is in planning for 2014. Fast forward to 1.5 years later and Worldtronics13, which will see the European premiere of some of the musical works and alliances that were formed the SoundCamp sessions in the lagoon landscape of Ruskin Island. The opportunity to showcase these works in Berlin, a place that has probably become the most significant capital city for electronic music worldwide, is an honor to say the least. It is a chance to test Berlin audiences and to feature the array of DIY culture that is flourishing in cities like Colombo, Delhi, Teheran and Karachi. In Pakistan in particular with labels like Forever South, Moshymoo and Karachi Detour Rampage genres that border on Shoegaze, UK Bass or Krautrock, electronic music taking on a dynamic of its own and is anchoring itself firmly within it’s very own South Asian sound spectrum. 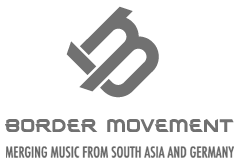 Every day, the musical output of other parts of South Asia is rapidly growing and changing in terms of electronic music. As in the West, improved internet, mobile connectivity and social media has helped artists connect, integrate and promote themselves. 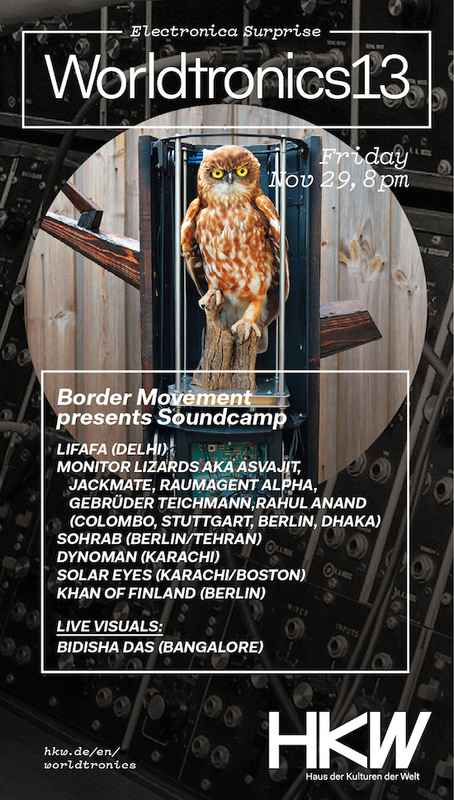 Border Movement are very excited about the upcoming Worldtronics Festival at Haus der Kulturen der Welt, as it is the first time artists from Pakistan, India, Sri Lanka, Bangladesh and Iran will have the chance to share the same stage let alone showcase their collaborative works on German soil. Field recordings from the streets of Teheran or chants of the Green Revolution are merged with ambient soundscapes. Songs of a lost home, sung in Arabic by his Algerian roommates who he met during the time he spent at a detention centre for asylum seekers in Eisenhüttenstadt are incorporated into experimental loops and beat constructions. SOLAR EYES is an experimental popband from Karachi. Almost all the members have their own other projects that contribute to the plethora of the experimental acts to be found there eg. Amman Mushtaq aka MOLE (vocals/synthesizer/drums), Danial Hyatt from ORANGE NOISE (vocals/guitar/sampler), Ziyad Habib also part of MOLE (bass/synthesizer/sampler) und the Hannah Cox (vocals/keyboards) from the USA who Ziyad met while studying music there. DYNOMAN is head of the label Forever South. His music is influenced by Ambient, Bass music, Abstract Hip Hop and Chillwave amongst others. THE MONITOR LIZARDS is an international collective that was forged during Soundcamp in Sri Lanka. Stuttgart-based House producer Jackmate aka Soulphiction joins forces with Bangladesh experimental artist, flute player & singer Rahul Anand, the Berlin’s DJ & producers DuoGebrüder Teichman, Noisician & hardware guru Ron Schneider (Transistors of Mercy) who held the circuit building workshops on Ruskin Island and last but not least, Sri Lanka’s most innovate Tech-House DJ Asvijit on the mixer. KHAN ORAL (Captain Comatose, Khan of Finland) who was also a participant of Soundcamp will be hosting the whole eventing.